Anne Line was known to relatively few, but to William Shakespeare, she became a powerful symbol of the faith that he held dear. Such is the argument of this carefully researched book in which Martin Dodwell portrays Shakespeare as a secret Catholic, writing subverse allegories in support of a faith for which, in that dangerous era, followers could be, and were, castrated and disembowed while still alive by way of punishment. 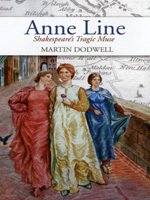 Piecing together disparate clues, including a rare Roman coin unearthed near Anne Line's birthplace, and information drawn from obscure manuscripts and letters, Dodwell has put together the most complete account yet of the life of Anne Line, and in so doing, raises startling new questions about Shakespeare's Cymbeline. Does this play conceal a subversive portrait of Anne Line and her husband Roger? Should we read Cymbeline as Symbol-Line? Was this work in fact a sophisticated critique both of the Protestant establishment and of Catholic radicals that ends with a plea for the reuniting of the Church and the healing of a divided Britain?